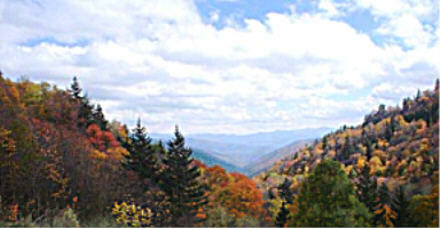 Almond NC cabin and vacation rentals are located near the Nantahala River and the Nantahala Forest. Browse this page for Almond North Carolina visitor information and direct links to Smoky Mountain cabins, restaurants, attractions, Lodges, Inns. Almond North Carolina is a quiet, secluded village on the banks of the Nantahala River in Swain County, surrounded by natural forest land. The Almond area and nearby Bryson City NC is a haven for outdoor enthusiasts. The Nantahala National Forest includes 537 acres of forests, mountains, waterfalls and numerous creeks and rivers. Take a hike on one of nearly 600 miles of trails and roads, or go whitewater rafting in the Nantahala Gorge or golf amid gorgeous mountain views. Almond North Carolina offers cabins convenient to the Great Smoky Mountains National Park and beautiful Fontana Lake with the highest dam east of the Rockies. SWAIN COUNTY CENTER FOR THE ARTS. Art exhibits and performances by local and regional artists. Changes monthly. National Park. Great Smoky Mountains National Park is indeed a special place. Among some of the features making it special are: Diversity. More than 4,000 species of plants grow here; A walk from mountain base to peak compares with traveling 1,250 miles north; Several resident plants and animals live only in the Smokies. A rich cultural history; From the Cherokee Indians, to the Scotch-Irish settlers, this land was home to a variety of cultures and people; Many historic structures remain standing. Clingman's Dome. Rising 6,643 feet above the Great Smoky Mountains, Clingman's Dome is the highest point along the Appalachian Trail and provides a 360º view of the surrounding mountains. From it's 54 foot observation tower the average viewing distance is about 22 miles, but on a clear pollution free day, views can amplify as far as 100 miles into 7 states. It is located on the state line ridge of North Carolina and Tennessee, the observation tower sitting equally in both states.